The Academic Laboratory training includes the preparation, execution and documentation of experiments at the university, which exceed the demands of practical tutorials in terms of level of abstraction. Academic Laboratory trainings are often carried out in a laboratory setting. 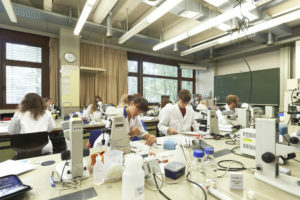 The preparation for the Academic Laboratory training is conducted according to the experiment description and generally includes literature or exercises connected to the experiment. The conduction of the experiment must be operated in accordance to experiment instructions. Your work must be documented in a laboratory journal. This documentation must contain the applied materials and methods, the results, an analysis and a discourse. At the Department of Computer Science, the Academic Lab module doesn’t really take place in a laboratory but consists of resolving a given problem with a hardware or software based solution and the analysis of the solution incorporating a database. The Academic Laboratory training is a non-graded achievement for which you will receive 5 ECTS points. Instead of doing one training worth a workload of 5 ECTS, you can also do two worth 2,5 ECTS. All courses offered by the Faculty of Engineering and the Faculty of Science that are marked as “Praktikum” (practical training) in UnivIS and fulfil the above mentioned requirements are generally applicable for the Academic Laboratory training (if not stated otherwise, see below). You can search specifically for practical courses in UnivIS by selecting for “lecture list” on the search, clicking on “expert search” and searching “Praktikum” as the type of course. By selecting further criteria (e.g. faculty, language) you can specify your search. The above lists contain English-taught and German-taught courses – please consult UnivIS to find out more about the ones your interested in. Practical modules (course type “Praktikum”) require previous registration – please browse UnivIS before the semester starts and register for the modules you want to participate in during the semester. More info on the registration modalities are provided in UnivIS. Not every course listed above is currently offered and the list of permitted courses is not exhaustive! If you intend to undertake a different Academic Laboratory training, which you cannot find in either of the lists please contact the study advisory to find out if your desired training can be admitted to the list. If you intend to work on an extensive project for the seminar Medical Engineering (after consulting with your professor), you can incorporate surplus ECTS credits of this seminar project in your module Academic Laboratory. For this, your professor must issue a second certificate including the title of the seminar and the note “Zusatzleistung” (additional achievement). Students of the branch of study “Medical Image and Data Processing” will find options for combining the Academic Lab module and the Research Lab module (total amount of 10 ECTS credits) in their module catalog (section M6).